Disney Heroes: Battle Mode is an action RPG made by PerBlue that features many of Disney’s and Pixar’s most iconic characters. Disney Heroes: Battle Mode for PC is actually a video game inside a video game. The first characters that you take control of are Vanellope and Ralph from Wreck-It-Ralph as they battle some bad guys which include a corrupted Mr. Incredible. His wife, Mrs. Incredible, also pops up to help them out. The cause of Mr. Incredible’s new evil identity is a virus that has infected the in-game world, turning good guys into bad guys. The entire premise is very similar to the virus that features in the Wreck-It-Ralph movies. As the game progresses more and more Disney characters team up to save the heroes gone bad. Every level of gameplay has enemies that come in three waves. Before that you will have chosen your own team of five characters and their combined strength is known as ‘team power’. Each successful battle earns the characters in your team experience points which can be used to power up and buy special items. As you progress you will also unlock special tournaments and arenas which are primarily PvP online battles. Chips are also given out for each successful battle and once you have enough chips then you can unlock a new hero. More chips equals a more powerful hero. The real meat in this game is all about the numbers. You want to level up the characters that you do have, making them stronger with upgrades and special abilities, while increasing the number of heroes available on your roster so that they are able to take on the more challenging aspects of the game and win in PvP tournaments against other real-world players. The visual style on this game is fun to interact with. It brings together characters from various Disney universes and renders them so well you can’t tell that each character was originally designed by different studios. Each hero is intricately drawn and some of them bring on a battle-ready grit that you wouldn’t have seen on the original shows. The music is also worth noting. It is a mixture of glitchy and quirky tunes that amp you up for each battle. Battles get monotonous and boring pretty fast. Once you’ve selected your team then they do most of the fighting automatically so the player just waits for the power gauge to fill then presses the button to unleash the special attack. From there the gauge empties and it’s the same thing all over again. With this system you cannot target specific enemies that you know are trouble and you have no control over which attacks to use, unless it’s the ultimate attack. There’s also an energy system that limits how long you can play for. 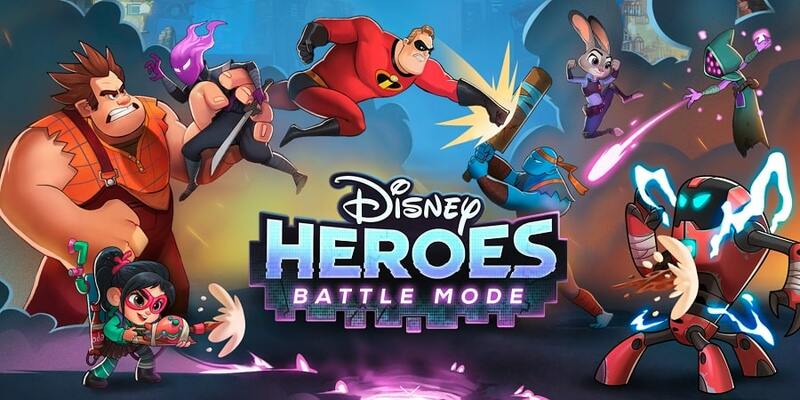 The gameplay is routine and plays out with you watching however Disney Heroes: Battle Mode is surprisingly enjoyable. The execution is entertaining and it is hard to ignore a game that brings together so many of Disney’s most beloved characters. Sometimes when playing Disney Heroes: Battle Mode, bluestacks ask you fee to pay but gives you option to download some apps. Every time it asks you just select “Install apps” and continue using it free. I hope you enjoyed this article, please rate and share. If you have problems running Disney Heroes: Battle Mode on your desktop or any other issues, leave a comment below.